info-beamer hosted is designed to make it as easy as possible to get started. All you need is a Raspberry Pi, an empty SD card and an info-beamer hosted account. Before you get started you should take a look at the device setup documentation page. It contains a wide range of tips and tricks that help you maximize the reliability of your installation. Make sure to read those tips. Some of them are important if you want an installation that keeps working years, like having a good case. If you bought a new empty SD card, you don't have to prepare anything. The SD card is ready to be used by info-beamer hosted. If you want to reuse an existing SD card, format it with the FAT file system. This is the default file system for external storage devices. On Windows select the FAT32 option when formatting an existing SD card. You can also follow these tips provided by raspberrypi.org. Be sure there's nothing important on the SD card you use. The complete SD card will be deleted! Installation of the software is trivial. 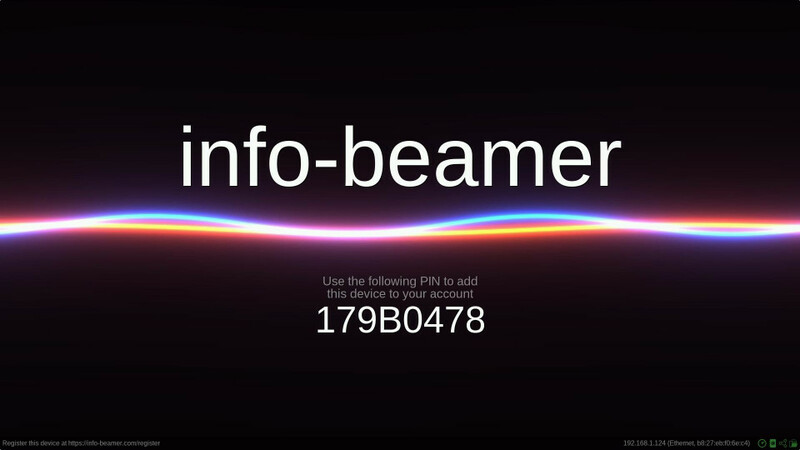 Just download the info-beamer hosted boot file from the device page. Extract the content of the downloaded install.zip file to your newly formatted SD card. That's all. If you're using Windows, you can follow our 5 step guide for installing using Windows. If you downloaded the install.img.gz file instead you can "burn" it to an SD card with a tool like etcher. Using the install.zip is a lot easier and faster though so it's recommended that you use it if you can. Have a look at the device configuration page if you want to customize your device and use features like WiFi. If you're just setting up your first device you should probably skip WiFi for now and use an ethernet connection as that makes things easier. You can always reconfigure a device later. The welcome screen has useful indicators that make it easy to confirm if the system is working as intended: You can check if you can see the complete ouput and verify that all required network service can be reached. In the bottom right corner you'll find information about the current network connection. You'll see the IP address as well as the network device used to establish a connection. If you see <no ip>, you might want to verify if your device is correctly configured. 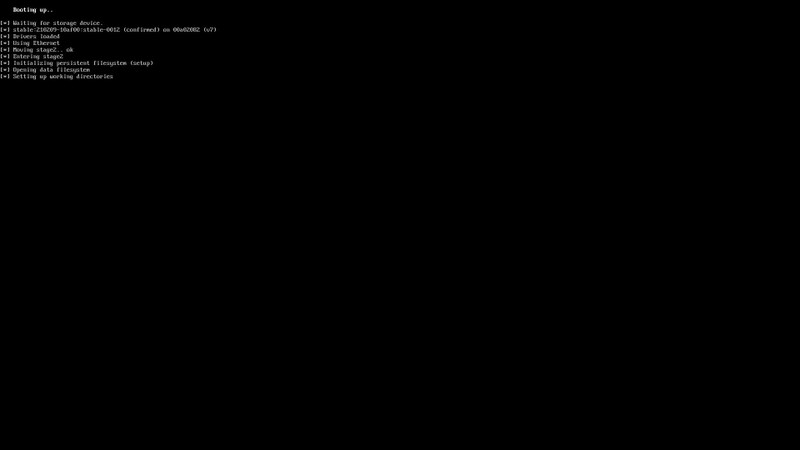 There is a small white dot in all four corners of the screen. This allows you to verify that you can see the complete output generated by info-beamer hosted. If you don't see those dots, you might have a look into your on-screen menu of your display. There might be options like Picture Size that allow you to adjust the visible area. If that doesn't help you might adjust the output using the overscan option. You can use the userconfig.txt file for that. There are four icons in the bottom right corner. Each of those icons represents a different feature that is checked when booting up. Each icons turns green once a feature is properly working. The sync host is reachable and the system can receive system updates and download content. All four icons should turn green after a few moments. If they don't, please confirm that your network is up and all the required services are reachable. Before you can put content on the device you first have to add it to your account. Visit the device list page and click the Register Device button. Enter the PIN you seen on the welcome screen of your device. Once that's done the device will be added to your account and you can start using it.